ISLANDBORN written by Pulitzer Prize winning author Junot Díaz and illustrated by Leo Espinosa is a heart-warming picture book about borrowed memories and diversity. All the children attending Lola’s school were born elsewhere. When the teacher asks her students to go home and draw a picture based on their memories of their birth country they are all excited. But not Lola. She came to her new country when she was just a baby and has no memories of her birthplace. The teacher suggests that Lola ask family members and neighbors what they remember. These borrowed memories bring her birth country vividly alive to her in many beautiful and challenging ways. Her cousin tells her about the bats as big as blankets! Her brother remembers drinking agua de coco right from the coconut! Miss Barnard hears music playing everywhere as people dance in the streets. Sunny beaches, fish, dolphins and whales come from her Abuela’s memory and her mother tells Lola about a wild hurricane as fierce as a wolf! Then Lola takes charge and begins to fill her sketch pad with drawings of the borrowed memories of her home island. The book’s illustrations are full of color, movement, sounds, joy and determination. Especially vivid are the two double-page illustrations that deal with Mr. Mir’s memory of a thirty- year struggle against a terrible political monster that took hold of the beautiful island. He tells Lola about the brave young women and men who “got tired of being afraid” and rose up and freed the island of the menace. 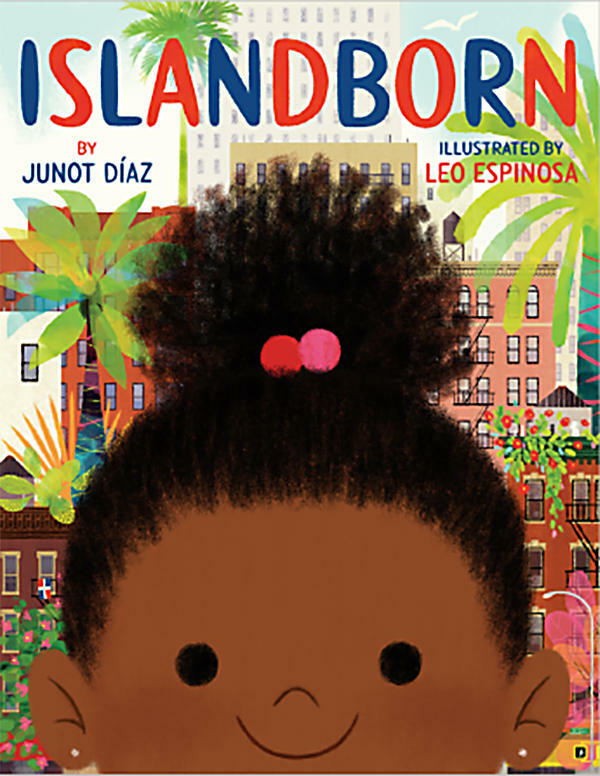 ISLANDBORN written by Junot Díaz and illustrated by Leo Espinosa is an especially genuine story about memories, culture and belonging for children ages 5-8 (Dial Books/ Penguin Young Readers Group, 2018). Lola learns all about the Island she left when she was a baby by asking her family and her neighbors to tell her the things they most remember about it. Turn to the last illustration and find the following borrowed memories that burst out of Lola’s sketch book: tiny fish, the sun, happy dancers, dolphins, palm trees blowing in a hurricane, a mango, drums, a coconut tree, a baseball player, a whale and brave women and men driving out a monster. How many smiles can you count? Why are there so many musical notes scattered through this illustration? How does this picture make you feel? Give this picture a title. The stories that Lola hears about her Island give her a greater feeling of belonging. Have you ever heard any member of your family tell a family story that gave you a fuller feeling of belonging? Often family stories take place around the dinner table and during holidays and are about traditions, pets, hobbies, trips and celebrations. When you remember one of these family stories draw a picture of it. Make sure you include all the details. If you cannot remember a story ask your parents, older siblings or grandparents for a borrowed story memory.